We’re using this week to discuss rapper Fredo Santana’s tragic death. Merk Murphy, of GBE’s management team, shared his thoughts on Santana and other Drill rappers not being accepted in Chicago. Below, content creator Mikki Veal shares her thoughts on Chicago’s PTSD problem. In a city known for harsh winters and deadly neighborhoods, it’s easy for outsiders to believe Chicagoans simply “get used to it.” How does anyone get used to 30 below wind chills? Probably the same way Black people on the South and West sides get used to seeing their loved ones in body bags. It’s not a matter of getting used to the way things are. It’s the hand we were dealt in Chicago. Our people are overflowing with trauma. The lucky ones – those with access to health care, support systems and money – are able to seek mental-health counseling to cope, if they want to. The unlucky ones don’t have that luxury. They turn to drugs and alcohol, two easily accessible vices, to numb the pain. Some of our favorite Chicago stars, even with all their fame and fortune, are chained to the latter. It appears those shackles might’ve recently took the life of our young star, Fredo Santana, at the tender age of 27. 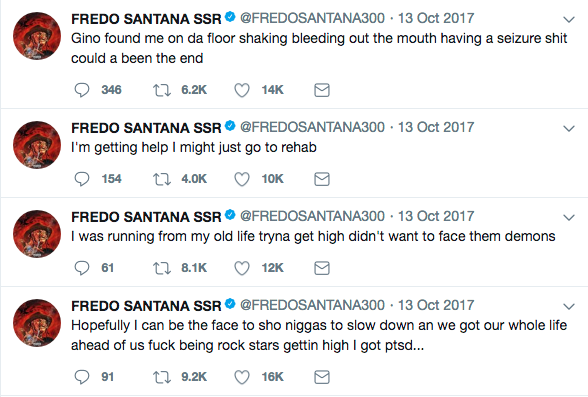 After a long battle with addiction to lean, a druggy cocktail of promethazine, codeine, pop and Jolly Rancher candy, Fredo reportedly died Friday night from a seizure – a common side effect of lean. He talked about going to rehab and getting help after being diagnosed with kidney and liver failure in October. Santana also spoke often on Twitter about using drugs to escape memories of growing up in Chicago and the friends he’d lost to violence. Twitter exposed a myriad of thoughts from outsiders, including angry tweets alleging Fredo didn’t care about his young son and girlfriend since he continued using drugs. It’s no secret that Chicago is often compared to war zones (re: ChiRaq). Our pain has become political banter to the outside world. When soldiers return home from war, though, their new behaviors – no matter how erratic – are immediately labeled Post-Traumatic Stress Disorder. Fredo grew up seeing an unimaginable amount of violence, and lost friends to it. Is he not a soldier? No disrespect to those who risk their lives to protect our rights and country. But, we’re fighting to survive in Chicago, too. And our fight wasn’t a choice. We didn’t sign a dotted line. We were just born here. There isn’t a one-size-fit-all solution to mental health. Most would suggest counseling or therapy, but sitting down with a stranger who has never walked in your shoes is not the easiest thing for everyone. Though Fredo probably had the funds to get all the help he needed, it probably wasn’t easy to do. Fredo was a rapper but, first, he was a human being. He bled just like us. He cried just like us. And he happened to find short-term escapes and happiness in drugs just like many of us. Don’t look down on those who suffer loudly or in silence. Seek understanding in their plight and wish them the best with healing. May Fredo find the peace he fought for every day, and become a beacon of hope for those who are still fighting. If you’ve got an opinion about something Chicago-related, email us at info@thetriibe.com.